Doom Eternal is being built to squeeze all it can out of modern hardware, even pushing the latest versions of the Xbox One and PlayStation 4 to their limits, its developers say. During a question and answer session following the Doom Eternal gameplay reveal yesterday at QuakeCon, id Software executive producer Marty Stratton said Doom Eternal is being built as a “next gen” game, capable of using every bit of graphics processing power available in the Xbox One X and the PlayStation 4 Pro. 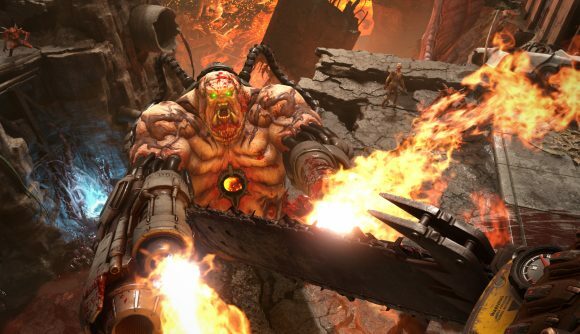 “I’m not sure so much that we’re taking advantage, as we will abuse them,” Stratton said, answering a question about Doom Eternal on the latest consoles. Doom Eternal is the first game to use the idTech 7 engine, and Stratton says it’s designed for the next generation of systems. During QuakeCon, the Doom Eternal demo was running on what Stratton described as “very high-end” PCs. “Everything you saw [in the demo], that’s pushing the envelope,” Stratton said. But Stratton pointed out that the latest version of idTech is very scalable, and so Doom Eternal will run on the vanilla Xbox One and PlayStation 4, as well as the Nintendo Switch, just like 2016’s Doom did. “Our goal will be to make it look like that at 4K on the Pro and the Xbox One X, never really sacrificing the 60 frames per second,” he said. A key to idTech 7’s scalability is the Vulkan API. Stratton said it allows the team leverage the power of high-end enthusiast PCs, while still being able to scale down to consoles like the Switch. Unlike 2016’s Doom, the plan for Doom Eternal is to launch on all platforms simultaneously. Bethesda still hasn’t announced a specific date for launch, but it’ll likely be sometime in 2019.